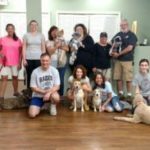 A happy CPT Beginner Agility graduation! What an awesome group! 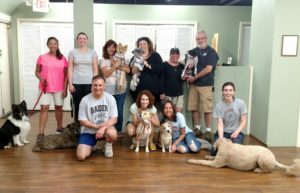 The class consisted of sizes from a Pomeranian to a standard Goldendoodle and ages from 9 months to 10 years- and the old guy held his own. Beginner Agility introduces dogs to all the agility obstacles, including the broad jump, single-bar jump, double-bar jump, triple-bar jump, winged jump, tire jump, pause table, open tunnel, closed tunnel (chute), a-frame, dogwalk, teeter, and weave poles. Upon graduation, class dogs should demonstrate confidence and competence with all the obstacles except the teeter and weave poles, which require more time. Then, most Beginner Agility graduates continue on to Intermediate Agility. During Intermediate Agility we obtain proficiency with the teeter and weaves and introduce physical and verbal handling skills, where each person learns to navigate his/her dog amidst increasingly complex multi-obstacle courses. Handling skills include heel, side, go, right, left, pivots, front crosses, and rear crosses. Most importantly, CPT Agility is GREAT FUN for both human and dog! !